17a, “NO, RHYME OR REASON” [Q: “Can I write both a poem and an essay?” A: “___”]. 36a, “NO, GREAT SHAKES” [Q: “Is that snack bar known for good burgers?” A: “___”]. 60a, “NO, MAN IS AN ISLAND” [Q: “Should you call that stopover between Liverpool and Belfast a peninsula?” A: “___”]. A cute idea, as expected from Patrick, and the execution is lovely. Even though the theme answers are all quite long, three theme answers feels a little light, especially for a relatively straightforward theme on a Thursday. 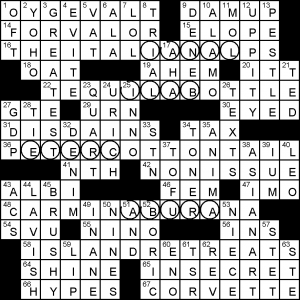 In lieu of an abundance of theme, we get quite a lot of Scrabbly letters in the grid: AIR TAXI, Teddy RUXPIN, GARBANZO, XBOX, Mario PUZO, KUNG FU, KIWI, etc. etc. Didn’t notice a ton of junk while solving — just -ETH, ISO-, SLO, and AN A. Ending on a high note, there was a truly lovely clue in this one! 64a, CRAB [Fiddler on the reef?]. Nothing else from me today. Until next time! The title hints that something is being separated in the theme answers. At first it’s not obvious; when I started to encounter curtailed phrases, I thought maybe the missing parts were bending upwards or downwards (or both). But then I noticed that several entries were clued simply as [Way]. When I saw their positional relationship to the main theme answers, the penny dropped. This is a not-uncommon theme approach employed by editor Mike Shenk. For the most part I enjoyed sussing out this theme. The entries are solid and the clues are spot on. The only thing that distracted was that three of the “ways” are fairly synonymous (meaning, a track or a trail) and one roughly means style or manner. It would’ve have been more elegant if all four used the same meaning of “way” or else each used a different meaning. Even two of each would have been better. Not much in the way of sparkly fill today though I do like SPARTAN and TABLOID. There’s a clutch of ODDISH entries (including ODDISH). I could do without FORERAN, and GABBLE really seemed like it wanted to be BABBLE or GOBBLE. 41a [“Metamorphosis of Narcissus” painter]. DALI. That’s this painting here. 67a [Light bender]. Good misdirection. I thought this was referring to a little drinking spree. 9d [Site for scareheads]. TABLOID. Again, never heard the clue word. Scareheads aren’t people; they’re alarming or sensational newspaper headlines. 51d [“The Burghers of Calais” creator]. RODIN. That’s this sculpture here. Enjoyable puzzle. 3.8 stars from me. It’s the dog days of summer, which means that most of the people I know without air conditioning in their building have one or more A/C WINDOW UNITS hanging out of a window to keep at least one room cool. 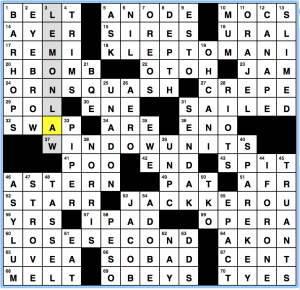 All of this week’s theme answers also have their AC hanging out the end of the puzzle – KLEPTOMANIAC and JACK KEROUAC on the right, ACORN SQUASH and A CLOSE SECOND on the left. 16a, THE ITALIAN ALPS [Lombardy skiing destination]. Lanai. 22a, TEQUILA BOTTLE [One of many standing in a Mexican bar]. Bali. 36a, PETER COTTONTAIL [Gene Autry Easter song critter]. Crete. 48a, CARMINA BURANA [Carl Orff opus]. Aruba. You might know Carmina Burana as the work that contains O Fortuna. An ambitious puzzle — lots of theme and plenty of interest in the rest of the fill (OY GEVALT, FOR VALOR, NON-ISSUE, CORVETTE, ASIAN ART) — as expected from Jeffrey Wechsler. Good stuff. This entry was posted in Daily Puzzles and tagged Alice Long, Brendan Emmett Quigley, Jeffrey Wechsler, Mike Shenk, Patrick Merrell. Bookmark the permalink. 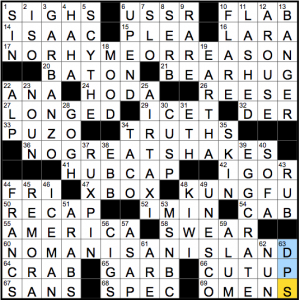 Liked the cluing in the NYT puzzle a lot, e.g., 22A. [What Alabama cheerleaders often request?] is amusing for ANA, 20A. [Meet stick] is great for BATON, etc. A little deception here and there but nothing too tough, a little cleverness, some trivia….elevated the fill a notch, for this solver. I concur with the comments. Good to find Merrell again! What a great puzzle day! WSJ took me way too long to see the significance of the repetition but a nice AHA moment when I did and could go back to make sense out of STUDYINGAB. Did not like CARMINA BURANA in the LAT [heck, it’s taken me years to remember ORFF] or BRUSHY or the cross with ALBI, but it was otherwise a nice puzzle. Might have preferred it without the circles as a Thursday. BEQ was a hoot. Like the WSJ, took me way too long to see that half the themers worked at one end and half at the other. BEQ: Liked the theme, but the southeast was marred by EPACT (really?) crossing AKON, which is pure Natick. No LAT review? New low for this site. Unfortunately, Gareth was unable to write a review for the LAT yesterday. I posted a short recap today — Mr. Wechsler’s puzzle was lovely, and deserved a few kind words. As a general note, and not in any official capacity as a Fiend blogger: the 15 or so bloggers who write for Fiend do so on a volunteer basis. 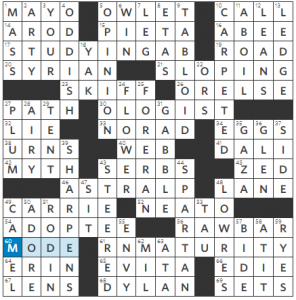 Fiend has covered several major daily and weekly puzzles every day for many, many years, dating back to 2005 when it was just Amy posting daily NYT reviews. With many puzzles (most reliably the NYT), Fiend almost always has a review posted within an hour of the puzzle going live. It’s exceptionally rare that Fiend fails to post a review the same day that the puzzle comes out, but the Fiend bloggers are human: sometimes we get sick, or have technological difficulties, or have family obligations, or are otherwise indisposed. We appreciate most readers’ understanding during these times. I know that I’m open to constructive feedback, and my experience has been that most Fiend writers and administrators are too. “New low for this site” doesn’t fall into that category. I’m not sure what your past grievances are with Fiend, but I hope in evaluating those grievances you’ll consider that the site is run by people who are not paid to do so, and who by and large post thoughtful reviews quickly and often, in service of the crossword community. If you would like to share those grievances, please do so kindly and in a way that we can address.